St. Adalbert Basilica will be open for visitation in the evening. Congratulations to Erin Blass and Eric Cichowski who were married Oct. 8, 2016 in St. Adalbert Basilica! Thank you to all who attended this year's Mass of Remembrance, and to Villa Maria Chorale for the beautiful music. Over 500 candles were brought forward this year. St. Adalbert's dome, taken during the 2015 Mass of Remembrance after the candles were lit and the rest of the church was darkened. Congratulations to Brenda Chodkowski and Desmond Rommel who were married Oct. 3, 2015 in St. Adalbert Basilica! 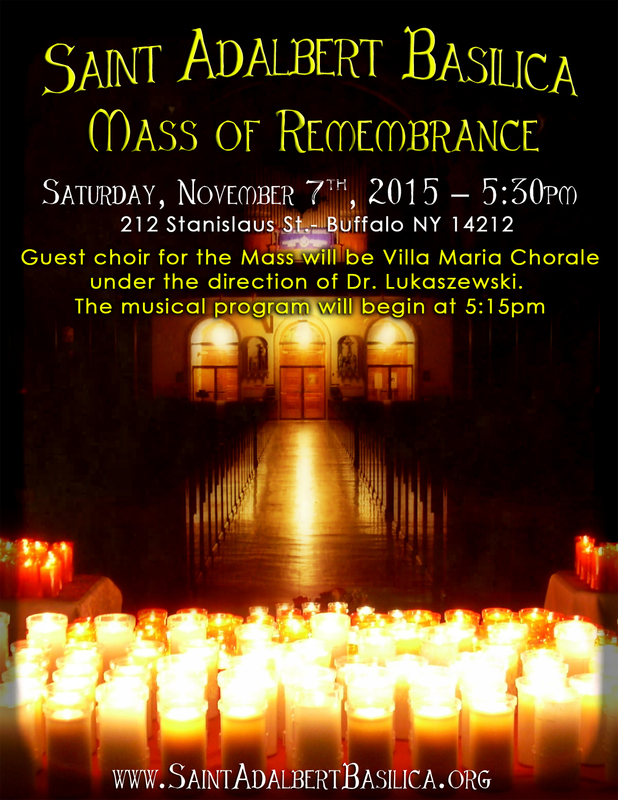 Please join St. Adalbert Basilica for their annual special Mass of Remembrance on Saturday, November 7th at 5:30pm. Please join us for a beautiful Christmas Eve Concert & Mass at St. Adalbert Basilica. We are honored to host soprano vocalist Brittany Mruczek accompanied by Steven Kroczynski. The concert of Polish Kolędy & traditional Christmas carols will begin at 3:30 PM. Mass will begin at 4:00 PM and includes children re-enacting the sacred story surrounding the birth of Christ. All are welcome to join us. Anyone who would like to help decorate the Basilica for Christmas is welcome to join us on Saturday, December 20th at 5:15 PM. Many hands make light work! Also, any children who would like to take part in the Christmas play should come at that time with their family to practice and to pick up a costume.